We had a fantastic first trip to America, being a family business we had to take our children and we had to go in August so we mixed work with pleasure. We had a wonderful look around New York enjoying the Brooklyn Bridge, the ferry trip to Staten Island to see the Statue of Liberty, walking the High Line and then a wonder through the busy streets and Times Square before relaxing in Central Park. It was a very hot, sunny day and the air conditioning of the subway was a welcome cool down. We walked lots and saw lots, we were amazed by the skyscrapers towering above us and we felt welcomed. Our daughter lost her first tooth on the subway and a lovely New York lady reached into her purse to give her a dollar! Precious memories! Of course we had to fit in some work and Liam and I spent many hours trying to work out the New York grid pattern and find places, not as easy as one would think. We were fortunate to join one of our customers on their roof to see the eclipse from 8 floors up. This was wonderful and in fact was easier to see as the clouds passed over. We didn’t get 100% eclipse but it was still pretty good. New York was hot, busy, a visual spectacular, something for everyone and a place we will all remember. It was nice to visit showrooms, understand the market place more, meet new customers and to be able to see things for ourselves. There sure is a lot of hardware out there, the choice has never been as great as it is today, coming from all areas in the world. One could almost feel like we are just another door knob.... but when you look closely, how it is made, the finish, the quality, the real choices then it gives you confidence there is indeed a market place for handmade by Liam, quality glass knobs. We are excited by the American market, customers clearly appreciate quality and we look forward to working with our customers across the Atlantic and hopefully get the opportunity to visit again! We are super excited here at Merlin Glass as we are finally taking our first trip to America. It has been a very long time coming but we are finally making the trip this August to visit colleagues and showrooms across New York. We launched Merlin Glass USA a few years ago now and have seen an increasing growth in our business. It is now time to explore opportunities further and finally put some faces to names and meet our good friends and colleagues. We are also taking out our very new and incredibly clever borehole adapter. I have been plagued with pre bore doors, something we don’t have in the UK, but we now have the solution, so watch this space. Luckily for us it will not all be work, we hope to have a look around in-between showroom visits. I am particularly looking forward to tasting some of that yummy New York food, visiting Central Park and soaking up as much atmosphere as possible. We are venturing out of the city heading up the coast on what I can only think will be a rather amazing road trip. I will make sure I take some great pictures to share on our blog, it’s not every day you get to travel across to America, so exciting! Running a furnace is quite a job, Liam often compares it to having a baby…. It needs quite a bit of attention. The furnace is a pot furnace, or crucible which is a lovely big white pot. It does an amazing job considering the extremely harsh environment it has to sit in. Like all good things, over time the pot erodes and eventually cracks which is then time to change. Our last pot has been the best ever and lasted a really long time, but when it goes, it goes always when you have orders to make and always when you least want it to. Here you can see Liam clearing out the cobalt blue glass which we had in the furnace and what the pot looks like. Liam will now do some maintenance on the furnace and put it all back together to get making again. It takes around a week to get the furnace back up to temperature around 1100 degrees and then a few more days for the glass to melt ready to make. The next melt will be peridot green as we have a really lovely order from Ireland. We are no strangers to sending our work all over the world and these really were a delight to make. This customer was moving to a new house with a new kitchen and wanted something a bit different to add a splash of colour and interest. These particular artisan glass knobs are a mix of greens, blues and white or aqua, turquoise and sea green which is often used to describe the colours. Each ones has been frosted which accentuates the colours along with the satin nickel collars. They are so pretty and this customer is going to finish off her kitchen with a matching splashback. This customer wanted colours of the sea and these really display a magnificent array of colours as the light shines through them. Always a delight to work with customers to get exactly what they want, Liam really enjoys making the artisans, he feels they demonstrate his ultimate creativity and expertise in glassmaking. Recently I have been offering customers the chance to facetime to help with the more interactive side of choosing glass knobs and it has been really effective. Of course it is not for everyone but it is brilliant to be able to have greater interaction and being part of the selection process, particularly in the artisan glass knobs. I am able to show lots of different ideas and quite quickly we can narrow the choice down. Customers have also taken the opportunity to show me their rooms, wallpaper, paint, soft furnishings, basically anything they are trying to match so I can help direct. I was blown away how easy and useful this process is, and by seeing customers interiors I can quickly match with colours we have. We have had a showroom for many years which customers visit and view the range, but this takes this process to the next stage as you can match the home with the product relatively easily. I am more than happy to facetime customers, I am not a massive web cam person, and I always think I could of probably dressed more for the occasion but once I get over myself and realise that this really is a practical and useful media for sharing of products. I am always at the glassworks on Mondays and Thursdays so if you do indeed want to take this opportunity then please do and I will happily show you colours, patterns, metal finishes, sizes and discuss through ideas. I really think this is a new and exciting why to shop, from the comfort of your own home, but interactively! Our Merlin Glass shower knobs are proving to be popular with homeowners in bathroom makeovers and remodels. With nothing else out there we can offer a truly bespoke product with fittings made to your glass thickness. More and more bathroom showrooms are catching on, mostly for our American customers. Clear glass is an obvious in traditional round on both nickel and chrome polished and satin collars. We have however, made many in lots of fabulous colours and different shapes. The bathroom environment is not for the faint hearted and most glass knobs would simply fall off with water and humidity, but not ours, as we do not glue them, we swage them on where the metal is rolled over the glass, so not a problem for our customers, along with our life time guarantee. We cannot think of anything more synonymous than glass shower doors with glass knobs for the ultimate look, feel and function. Recently enjoyed working with the very talented Medina, Interior Designer for MK Kids interiors, specialising in interior design for children. Medina was working on a project designing a beautiful baby girls bedroom. Her brief was to ensure the design fitted both the baby years and beyond carefully sourcing materials which would grow beyond the baby days fit for any princess. January has become an exciting month for us her at Merlin Glass as the Best of Houzz winners are announced. We have been lucky to have been awarded The Best in Customer Service for the past 3 years now and we are delighted we have made it again and been awarded Best in Customer Service 2016. These awards are really important for us as they are completely customer focussed and based on customer reviews. We already know we get to work with some of the nicest people and beautiful homes and this is just the icing on the cake. When you visit our Houzz pages whether it be in USA or UK you can really get a sense of who we are, what we do and what you mean to us. Sometimes it gets hard to explain about how passionate we are about what we do, but these customer reviews really do bring this personality to life. Yes of course they are just glass knobs, but homes are important to people and indeed how we furnish them and we just want to make sure whether it’s your kitchen, bathroom, bedroom or indeed your whole house you get exactly what you are looking for. Merlin Glass have been voted by the Houzz community as a winner of the Best of Houzz 2015 awards. Our work won in the Customer Service category, and we are one of the top rated home building, renovation and design professionals in the UK, USA and around the world. Naturally we are delighted to have won this award 3 years in a row, it reflects the quality of our work and our first class customer service. A huge thank you to all our customers who take the time to review our products and appreciate highly skilled craftsmanship. Beautiful Kitchen - nice glass knobs too! When we work with customers embarking on a major project we get to know them fairly well. Most customers never think about glass knobs for their kitchens so when we get to talk glass it`s rather exciting! I always ask for photographs and rarely do we get sent any but today we have and I am so pleased our customer has agreed to be able to share them on our website. Here we have clear glass oval cabinet knobs on a polished nickel collar used throughout the kitchen. They do add those all important finishing touches and because all our work is guaranteed for life the customer can be rest assured they will be there for as long as the kitchen will be. Thanks to our lovely customer for a picture of the glass shower knobs which Liam made for her shower doors. This was part of a larger order where these clear glass balloons were being used throughout the house, these are 44mm or 1 3/4" on a polished nickel collar used as cabinet knobs and closet doors. Yes this is indeed beautiful handmade English Walnut wooden door knobs on brass roses....... but wait there we are glassmakers! Yes indeed we are and I always go on about how lovely our customers are, and they are, but sometimes I just can`t say no. That is what has lead us to these lovely creations. It started with glass door knobs and we made some very lovely deep purple smooth door knobs on polished brass roses. Our customer was delighted and completely in keeping with their 18th century manor restoration. A discussion then happened about some delightful original wooden door knobs that really needed to be in keeping with the original features. At this point I should have said no, we don`t make wood but it was the brass roses our customer particularly liked and wanted the glass and wood to match. So I set about on what seems to be a long journey, any maker will know nothing is straight forward with new fittings, new tools, new everything to make these beautiful creations work. Finally the finished version, something very different for us and when we talk about a design service this really does go above and beyond anything we have done before! It`s not surprising that since we made our first glass knobs for showers a few years ago we have seen a huge demand for these. Glass in bathrooms is synonymous and by adding a pretty glass knob to the shower can really add those finishing touches or a splash of colour. This lovely collection here are off to America where the customer has order glass throughout. Using strong colours of teal, sapphire blue, cobalt blue and peridot green each room has matching door knobs, cabinet knobs and yes shower knobs. They are displayed here on a polished nickel and then satin as the customer required. All our glass knobs can be made for shower doors all we need to know is the width of the glass and the size of the hole. We have been big fans of Pinterest for some time now but it would also appear that people love what we do. For those are not familiar with Pinterest it is a pinboard style photo sharing website that allows user to create and manage theme based image collections. It is a breath of fresh air and you can create a visual sensation based around whatever you like, warning it is quite addictive! We were so excited to get an email from Pinterest to tell us that our UK website is one of the top sites on Pinterest and last month our images were repined 2,489 times. Wow that’s wonderful to see people appreciate our glass knobs. They are not just a functional item they are very beautiful to look at in terms of colour and pattern and that’s why people are happily pinning them to their boards. It is fascinating to know what people are looking at and pinning, for the month of February our most repined glass knob was our cobalt blue chequerboard door knob. I think people like this image because it is such a strong colour mixed with the clear and frosted glass in the chequered arrangement really creates something highly visual. You can view our pinterest at http://www.pinterest.com/merlinglass/ and see our boards and pins. I thought long and hard about putting a personal achievement on our website but then realised it’s not all about work and why not! I would not classify myself as a runner but have dabbled a bit in the past and found running to be the only thing which really worked in terms of weight loss, getting fit and toning up. After our wonderful weeks holiday in Morocco this January I realised I really needed to do some fitness. I am also quite an impatient person and the minute I say fitness I want to be fit and look fantastic! It is with that I mind I decided it would be quite fun to run every day in February and use social media to keep me on track. It’s amazing how it tricks the mind into thinking you will be letting others down if you don’t do it. It started out quite hard, I planned to run 3 miles a day and off I set in what seemed to be extreme weather of wind and rain. Some days were easier than others, some days I had companions mostly children which was fun. I annoyingly made the mistake of trying to beat my time, my advice to anybody is not to worry about time, just get out and enjoy it. I pulled a muscle in my leg which nearly compromised this challenge. I found as time went on some days I ran further and my attitude towards fitness was really changing for the better. Through twitter using running and fitness hashtags I found new followers and really inspirational tweets and blogs which are great motivators. I completed my challenge and run 101 miles and burnt 11,530 calories, my body is starting to change shape and I feel really motivated to keep this up. My advice is to just get out there and do it, get a running watch it helps, set yourself a challenge it is great to feel the sense of achievement, use social media to help motivate and find likeminded people. Running for me is about fitness, wellbeing, connecting with the local environment and some much needed me time. Merlin Glass has been awarded “Best of Houzz” by Houzz, the leading USA platform for home and remodelling and design. Chosen by the more than 16 million monthly users Merlin Glass was voted for the best customer satisfaction, the second year in a row. The Best of Houzz award is given in two categories: Customer Satisfaction and Design. Merlin Glass has won the customer satisfaction honors determined by a variety of factors, including the number and quality of client reviews a professional received in 2013. Winners will receive a “Best of Houzzz 2014” badge on their profiles, showing the Houzz community their commitment to excellence. These badges help homeowners identify popular and top rated home professionals in every metro area on Houzz. Naturally we are delighted to have achieved this award the second year in a row. We really do get to know our customers and completely understand how important it is for them to get exactly what they want. Because it is just Liam and I, customers do get a very personal service and we believe we put our customers first in everything we do, exceeding expectations and always available for advice and ideas. Therefore to receive an award based on the quality of client reviews that we have received in 2013 is just perfect. You can follow us on Houzz by clicking on the green icon at the top of the page, here you can see our projects, read our customer reviews and explore the wonderful world of Houzz, it is an amazing source of inspiration and creativity, with every imaginable idea and so much more! Thank you Houzz and thank you to all our lovely customers. Award winning designer Darren Morgan has shared with us these beautiful pictures of one of his latest kitchen designs. Based in rural Ireland this kitchen is not only visually impressive it is a family friendly multi-functional space. The design brief for this new build included somewhere the family could live, work and play which is child friendly. An edgy, contemporary look and plenty of worktop space formed the criteria alongside one homeowner liking curves whilst the other preferring more linear shapes and angles. With this in mind the kitchen has been designed firstly on the families functional requirements, layered with aesthetics, sociability and entertainment to create a complex blend of practicality and style which is individually designed around the homeowners. We were delighted when Darren contacting us requiring some high quality glass knobs. Darren chose our purple glass cabinet knobs on a polished chrome collar. It is little things like this which really add those finishing touches and add a splash of coordinated colour to these beautifully crafted cabinets. Thank you Darren for sharing this beautiful kitchen with us, you can read more on this story at http://www.designer-kitchen.com/cdata/46135/docs/5811808_1.pdf or visit Darren’s website www.designer-kitchen.com for further information and inspiration. Merlin Glass is delighted to be part of the `Your Liskeard` project as part of the Portas Pilot programme. The town team worked with local photographer, Stephen Tolfrey of Studio Wallop to create a series of 35 eye-catching narrative portraits, captured in their retail setting in ways that also reflect their personal passions and personalities. The film captures the warmth, individuality and humour of the people which make up Liskeard. The photography project is just one of the many initiatives introduced by Liskeard Town Team as part of its ongoing commitment to give the town a boost. A portion of the £100,000 awarded under the Portas Pilot programme from the government is being used to help support the project. Liam and I had lots of fun doing the photo shoot but we don't think we will be the next posh and becks! Thanks Stephen of Studio Wallop for the great images. This has been a really exciting project for us, architecturally amazing buildings, iconic and breathtaking, naturally we were delighted when we were contacted to make some glass door knobs. The Flame Towers comprise of three complexes of residences, a hotel and office space which tower 620 feet over Baku in Azerbaijan. Each of the buildings have gigantic display screens with more than 10,000 high power LED luminaires which can be seen for miles. It has been really exciting working on such a prestigious project and working internationally with the interior designers. Projects like this take several months but the end results can be seen here with our clear smooth glass door knobs on a polished chrome rose. Merlin Glass is delighted to be nominated for the South West International Trade Awards, Brand category. We have worked so hard to get our name out there, so to be nominated for this award is wonderful news. It has been a very busy year for us here at Merlin Glass, with two international trade shows in January, the launch of Merlin Glass ipad app, silver award at the Cornwall Business Awards for excellence in marketing, the launch of Merlin Glass USA and now the best in brand category. To have international brand recognition is a wonderful achievement and really is the icing on the cake. Not only do we make beautiful glass knobs, we are a truly international name. This week sees the launch of Merlin Glass USA, the world’s leading British manufacturer of decorative glass knobs. With over 30 different designs, available in 20 colors, in any makeable size with a custom made option Merlin Glass offers a completely new experience for American home owners and related professionals. Merlin Glass has raised the bar for glass hardware, offering the US market an exceptional must have new home interior product. One that is beautiful to the eye, tactile to use, a visual and functional art form which fits in with any interior theme be it traditional with a classic touch or a more modern, contemporary twist. Merlin Glass has an impressive portfolio of projects . As a small company you get a personal service, highly knowledgeable with attention to detail. Putting the customer first, caring about their requirements, exceeding expectations and always available for advice and ideas. Merlin Glass designs are original and authentic influenced by architecture, history, nature, living and built environment, creativity and art and the playful characteristics of Liam and glassmaking. Liam and I attended the 2013 Cornwall Business Awards last week for our nomination for the Excellence in Marketing category, to recognise the Merlin Glass App. We were delighted to be joined by Paul Tudor of Tablet Brochure http://www.tabletbrochure.co.uk who made our wonderful app. We had such a wonderful night, it was great to see so many Cornish businesses from all corners of Cornwall. What was particularly exciting was to see the mixture of businesses, the innovation and dynamism from within the County. The Cornwall Business Awards are the most prestigious business award in the County and a celebration of innovation and achievement. Merlin Glass is delighted to have been shortlisted for the “Excellence in Marketing” award. This award recognises a specific marketing campaign that has achieved high levels of commercial success demonstrating innovation and measurable business results. We believe our Merlin Glass App delivers exactly this, being an innovative, mobile marketing app we have been able to share our work with a global audience from prestigious trade shows in Paris and Cologne to architects and interior designers. From our glassworks in Liskeard, Cornwall we can share our work, watch Liam glassmaking, join in our conversations via our social media sites and purchase our work from anywhere in the world. We have always believed we have a world class product and now thanks to our mobile marketing app we can share this anywhere in the world. It is fantastic to get recognition from such prestigious awards within our County. We are a proud Cornish business which appeals to many of our customers who like to share their stories and links to Cornwall, which also spans across the world from childhood holidays and family ties to mining heritage and artisans. The awards ceremony is on 16th May and we look forward to meeting all kinds of Cornish businesses and being part of this wonderful event. We would also like to share our thanks to those that have joined our journey, providing support, creativity and enabling us to achieve our goals. Delighted to showcase the work of Moir Wade, an interior design and handmade furniture company specialising in bespoke furniture both unique in design and unsurpassed in quality. Last year we started a venture with 9 other Cornish companies to raise the bar for Cornish design and products and provide an integrated design service. The group has a great deal of talent, expertise, innovation, cutting edge services and a big personality! Already members can see the benefits of working together as well as customers. Working with trusted professionals provides a first class service and piece of mind. We have some great projects coming up alongside some fun activities. In June the guild are coming along to try their hand at glassmaking! Watch this space for the photographs. It is currently under development but will be ready to launch in May. We have been sending our work to America for some years now, but this new standalone sister site will provide our USA customers with an entirely new, dedicated shopping experience. 2013 is proving to be a very busy time for us here at Merlin Glass, as an artisan glassmaker Liam is pleased that his work appeals to the American market. Liam feels the future for Merlin Glass is looking very positive and is looking forward to visiting America as part of the big USA launch. Merlin Glass has been awarded “Best Of Houzz” 2013 by Houzz, the leading online platform for residential remodeling and design. We have been chosen by the more than 11 million monthly users that comprise the Houzz community. The Houzz “Best Of Houzz” award for 2013 is given in two categories: Customer Satisfaction and Design. Customer Satisfaction award winners are based on homeowner members who rated their experience working with remodeling professionals in 12 categories ranging from architects, and interior designers to contractors and other residential remodeling professionals. Design award winners’ work was the most popular among the community of 11 million monthly users, also known as “Houzzers,” who saved more than 124 million professional images of home interiors and exteriors to their personal idea books via the Houzz site, iPad/iPhone app and Android app. As Asian-led mass-manufacturing is nearing is zenith due to the saturation of world markets, western consumers are waking up to the values of the ‘home-made’ product. A product which forsakes the accepted interface of global design trends and ideologies for the beauty of an object with an identifiable identity, a meaning close to the cultures of those using it, an authentic story of its own and a value adding to the economy and people of its country of origin. craft, but also by the creative ingenuity of contemporary design. Especially where high-end, low-volume products are concerned, the term ‘MADE IN BRITAIN’ also highlights a revival of the values of Britain’s traditional crafts sectors. In a truly amazing come-back, the buoyant British crafts – mostly consisting of small and medium-sized enterprises – today provide employment for nearly 90 000 people and contribute £3 billion annually to the British economy, which is more than the visual arts, cultural heritage or literary sectors. Crafts represent 13% of all those employed in the creative industries and demonstrate higher employment growth rates than any other creative industries subsector. It is this design angle - the contemporary ‘added value’ to the maker’s craft - however, that has lifted the skill-based work of the artisan onto the level of creative excellence. And it is this very specific, almost ‘indigenous’ crosscultural, multifaceted creativity, which is so symptomatic of the United Kingdom – that makes design from Great Britain stand out on the global platform. British design is playful and thought-provoking, but above all it is a strong indicator of the individuality and uniqueness of the excellence and true spirit of British creativity. January is a very exciting time for us here at Merlin Glass as we prepare to showcase our work at Maison and IMM. To attend one of these highly regarded international interior design shows is a huge accolade but we are very fortunate to be going to two. The IMM is an international furniture show based on good products and good ideas make for good business. We will be exhibiting under the exclusive British Design Group in the Pure Village. The Pure Village exhibition format provides a lively setting for unconventional brand and product scenographies and uses attractive juxtapositions and emotional scenographies to showcase design items and interior concepts to maximum effect and is guaranteed to provide inspiration en masse. We should fit in a treat! Maison & Objet is one of the most important and successful European events for all sectors relating to interior design. The theme for the '2013 inspirations' at the fair is 'vivant', selected as a reaction to our dematerialized, virtual world in which everyone is searching for 'a new vitality'. We are rather excited about our attendance at both of these events, in terms of the creativity and craftsmanship in our glass knobs we are sure to dazzle and shine the spotlight well and truly on Merlin Glass. Looking For Beautiful Homes Would you like your home to be featured in one of the interior magazines? We are looking for our customers past and present to work with an interior designer and journalist. We of course want to show off our fabulous glass knobs so whether these are in your lounge, kitchen, bathroom, study we would like some shots to put your story in the glossy magazines. Whether it be 25 Beautiful Homes, Homes and Gardens, Elle Deco, The English Home, Kitchens, Bathrooms and Bedrooms this is great opportunity to show off your fabulous home, have some fun being interviewed by a journalist and stylist and have your very own professional photography shoot. We have teamed up with Anna Tobin http://www.annatobin.com/ a freelance journalist and stylist. Anna is looking for all kinds of properties and projects and budgets, the only prerequisite is that they look good. If you would like to take part in this exciting opportunity please contact us. Words cannot describe how this made me feel, on a personal level I love it, of course I love it, it’s Liam, but I also love the fact that it is a beautiful painting. The use of colours from the glow of the hot furnace to the black undertones depicting a hard days work. I have taken many photographs of Liam making but there is something quite magical about a painting transforming the imagery into real life. The painting is an oil and you can almost smell the glassworks and feel the heat from the furnace. It was a pleasure working with Jackie making a beautiful selection of glass knobs for her home. It really was a wonderful surprise to see this painting, merging two art forms together to create a story. With many thanks to Jackie. Naturally we love door knobs and really like this article featured on the Huffington Post. David a hardware store owner based in Bethesda, Maryland recently needed a creative use for his discontinued door knobs and home accessories. He chose van Gogh's iconic painting, "Starry Night", using 1250 doorknobs, levers, plates and other odd materials. His finished piece of artwork can be seen on display outside his store. Since we launched our website Liam's artisan range has become really popular. These are all about art for doors, no two the same and they are bursting with personality. When buying these pieces I ask for colour options and then send pictures showing ideas of colour and pattern combinations. I really enjoy the design aspect of my role helping customers get something very special for their doors. I do have my favourites and sometimes feel sad to see them go, they are encapsulated with Liam's creativity, I love them all. However, we are delighted when customers send us pictures so we can see what they look like and how they are admired by many. The examples shown here, kindly sent to us by Adrian, show a beautiful lime and berry swirl and a raspberry and blue mosaic glass door knob on a polished nickel rose. The above images were initially chosen on his colour requests from which Adrian chose his exact pair. The colour in these door knobs are made from coloured glass, they are solid pieces and quite simply beautiful. Thank you Adrian for sharing your pictures with us. Being fine glass knob makers we work with some of the most prestigious and talented kitchen and furniture makers around. We are delighted to be working with Guild Anderson, who design, make and install some of the finest kitchens in the south of England. Located in Wiltshire, Nick and Hannah Anderson and their dedicated team of craftsmen and women make high quality, bespoke kitchen cabinetry, dressing rooms, libraries and freestanding furniture. We were delighted to make their cupboard knobs for their beautiful new showroom kitchen display. Elegant yet simple solid glass balloons on a polished chrome collar to complement their crisp white cabinetry and marble tops. Sharing our core values on quality, functionality and craftsmanship this kitchen works on every level. It is a pleasure to work with likeminded people, who enjoy creating and making beautiful spaces. To view their portfolio go to www.guildanderson.co.uk or call 01747 820449 for information. Thank you Guild Anderson for sharing your beautiful showroom with us. We are delighted that Liskeard is 1 of 12 towns which has successfully bid towards £1.2 million of funding to breathe life back into our highstreets. The government describe Liskeard as a hidden gem and has awarded £100,000 towards improvements alongside a team of experts. "Town teams" will try out ideas proposed by retail guru Mary Portas in her High Sreet review. Mary will make a TV programme about the 12 towns. In March, the government announced it had accepted "virtually all" 28 recommendations made in the report it commissioned from Portas on how best to revive the High Street. The 12 towns are being referred to as "Portas Pilots" with an expectation that more help and funding will be available to other towns. For Liskeard its strong Cornish community will be united with a range of projects including creative arts such a yarn bombing - filling the town with colourful knitted creations to add fun and mystery and guerrilla gardening! We are delighted that Liskeard has been selected, particularly moving more towards the creative arts. We believe that creativity is what will regenerate Liskeard and look forward to seeing a local vibrant arts scene mixing the old with the new to give both local people and visitors a town to be proud of. 1 Please can you tell us who you are and what is your interest in glass? 1A: Hi! My name is Patricia Linthicum and I live in Bahama, North Carolina, USA. 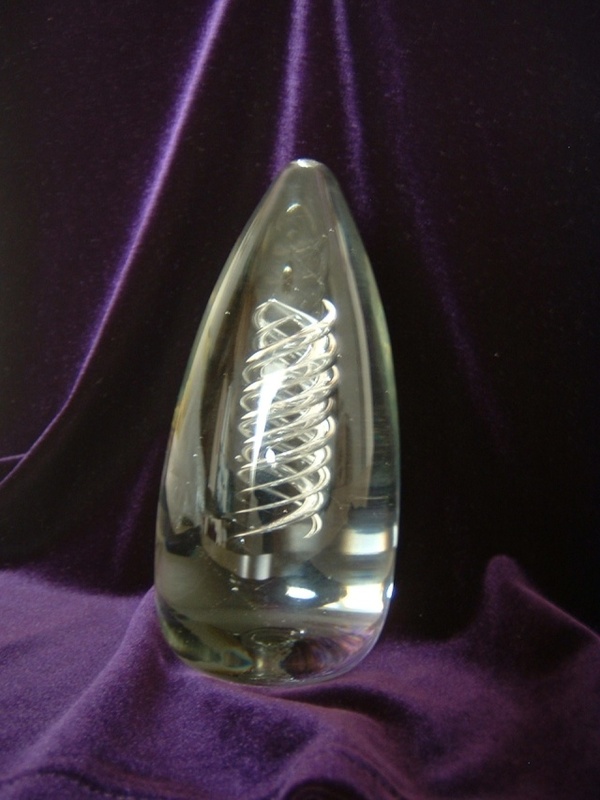 Currently, I write a blog, Looking At Glass, http://lookingatglass.wordpress.com/ and moderate the Twitter chat, GlassChat. Both Looking At Glass and GlassChat are about glass used in art, architecture and interior design. 2 Tell us about your blog and why you do it? A2: In March 2009, I was working as a facade engineer for a facade contracting company. At that point, the US economy was in a tumble and commercial construction just stopped. The company that I worked for was forced to layoff (redundancy) some of it's employees and I was included in that layoff. With the industry downsizing, I realized that I might need to find another type of work. I started reading interior design and architecture blogs as a way for me to figure out what I might enjoy doing and to find job leads. When I saw something I liked on a blog, I would email a link to all my friends saying something like "don't you love this?" or "hey, isn't this cool?" I think I drove everyone crazy because I was filling up their email inbox everyday! Then one day, I decided that it would be easier if I would just start my own blog and on July 12, 2010, I started writing Looking At Glass. Looking At Glass blog has evolved over time. Originally I blogged more about glass in architecture because that is where my all of my work experience was. These days, I tend to write more about decorative and art glass. It's just what I find interesting right now. 3 What has been your favourite blogs and why? A3: Gosh, there are so many blogs that I like it is hard to say. I currently have a favorites folder with about 150 different blog links saved. I also have RSS feeds to almost 250 blogs. I watch so many blogs that I can't read them all in a day! A few that I always read when there are new posts are: Well, your blog :-) , Freshhome.com, Karmatrendz.com, Dreamwallsglass.com, to name a few. Now that I'm thinking about it, if you look at the blogroll on Looking At Glass blog (right column about half way down), most of the blogs listed are the ones that I read and liked when I started Looking At Glass. I have to admit that I have not been very good at updating the list. I get attached to the blogs that I like. Getting to know the personalities behind the blog is always interesting. It's like watching a television series and getting attached to the characters. A good blogger's personality will reveal itself and part of the fun is watching it develop over time. 4 Where do you get your inspiration from? A4. The internet, books, nature. I don't watch very much television. If I'm not scouring the internet, I'm reading a book, or puttering in my garden. 5 You have some beautiful pinterest boards, can you tell us what pinterest is and which ones are your favourite? A5. Pinterest is an online community that was created to allow users to share photos and videos that they like with other users that have the same interests. On Pinterest you "pin" photos or videos to you're a pinboard or board. Over time you find other users boards that you like and you follow the user and or their board. Then, when a pin is added to a board you are following, that pin is shared with you. If you like it, you can repin it to your board. You end up with a continuously updating collection of photos and videos. It's great fun and can be a little addicting! I joined Pinterest February 4, 2011 and have been happily pinning ever since. I knew that I would like Pinterest because it is such a visually stimulating place. http://pinterest.com/lookingatglass/glasschat-holiday-party/. It really put me in the holiday spirit. There are very sweet and very funny pins on that board. 6 Where do you see your blog /interest in glass in 3 years time? 6A. Three years can be a lifetime where social media is concerned. It is hard for me to imagine not writing Looking At Glass, but I expect that before too long blogs will morph into something else. I think Pinterest or another platform like it will be the next generation of blogs. In the first 4 months of this year, Looking At Glass has already passed the total blog views from last year which was just over 45,000. If it continues at the same pace, the blog will have over 100,000 views this year. I can't hardly imagine past that! Thank you Patricia, really interesting to see the use of new media and how resources have influenced where you are today and indeed your future. The Guild is a collaboration of 10 of the finest design experts in Cornwall, from architectural interior designers to bespoke furniture makers. The Guild’s philosophy is to create sustainable, environmentally responsible design and innovative luxury combined with the highest possible standards of service and attention to detail. Working directly with the architects, owners and custodians of Britain’s finest properties, the group is available to collaborate to turn ideas, desires and aspirations into inspiring, unique and extraordinary spaces. Through their endeavours locally and nationally, all members aim to work together to raise the profile of Cornwall-based design and provide an invaluable new service within the county. Our customers come from all over the world and we really like it when they share their homes and indeed pictures of Liam's work. Here we can see a beautiful converted chapel in Scotland home to Kerry and her family. They have been converting this beautiful chapel over several years and we were delighted they chose Liam's clear oval knobs for both doors and cupboards. Kerry clearly has an eye for interior design and wanted her door knobs to reflect the clean, contemporary look of the rooms. The ovals on a polished nickel rose really contribute to the look and feel of Kerry's stunning home. Thank you Kerry for sharing your beautiful home with us. This week we were invited to the Interiors UK show at the NEC in Birmingham. We were invited there by Mary Portas and her business partner Peter Cross and the House of Fraser. Mary is looking for homeware designers to put their products into the Mary shop within the House of Fraser. Naturally we were delighted to be selected out of 170 applicants; only 13 were asked to come to the Interiors show where our products were showcased. It was great fun to meet the team and talk about our work. They loved Liam's glass knobs and particularly like the colours and shapes of the cupboard knobs, favourites were the millefiori, artisan and flowers. It was nice to see the other products and companies which included textiles, wallpapers, lighting, kitchenware and up cycled furniture. We look forward to discussing new ventures with Mary and the House of Fraser. Whilst we were at the Interiors show is was nice to have a look around and see some very beautiful furnishings. It was also nice to see so many traditional English companies displaying their finest products. The interiors show has something for every taste and fashion, bright colours, retro, glamour you name it you will find it amongst the 5 halls displaying design elegance, contemporary design, flooring, lighting, decor and living lifestyle. Glass Photography If anybody has tried to photograph glass they will appreciate how difficult it is, particularly clear glass and flat glass. This week on our twitter glasschat we had a very interesting discussion with guest host Bernard O'Sullivan, professional photographer from Inside Out Photography. He was so informative I want to share the discussion with our blog visitors. Q1 How do you photograph/light glass blowing? A1 Use natural light to record the warm-glow of the glass, supported by a medium powered flash fitted with a red coloured filter. This filter mimics the warm glow from furnace/glass, place filtered-flash near to glowing glass/furnace, facing blower. To avoid harsh lighting and reflections, never use a flash attached, or near to the camera. Q2 Is there a different approach needed for coloured as opposed to plain neutral glass? A2 Obviously coloured glass is darker than clear, so therefore needs more light or longer exposure. If you want a black background for smaller products, use a decent size translucent Perspex sheet 5x5ft backlit by flash. Frame your shot tightly, with frame area only masked with black material, with out of frame Perspex providing light-spill. The lit Perspex out of camera frame is what the glass catches to produce shape. This is called ¡®Dark field illumination¡¯ (like a picture frame with light wide frame and dark picture/centre) With stained glass you can get away with stronger slightly more direct lighting i.e. direct sunlight from behind. If you are backlighting with no ambient light from front you will not have any reflections, even the camera. (on Tripod) Q3. How do you show plain neutral flat glass? A3. For small pieces use ¡®Dark or Light field illumination¡¯, this refracts at the edge of the flat piece, creating a clear dark line! Then place something like a thin piece of wood leaning against & behind the translucent Perspex. This casts a soft shadow and gives the flat area of the glass tonal form. Q4. How do you show off architectural glass installations to the best advantage? A4. If shooting something like an atrium from inside looking out. Choose a day with blue sky, this will help the glass stand out. Avoid cloudy skies; the sky will merge with the (white) supporting steel work and glass creating one indistinguishable area. To shoot exteriors, it is often a good idea to shoot at dusk, when the sky is a deep blue rather than completely dark. At this ¡®Golden moment¡¯ the lighting level inside the building should match the soft evening glow outside. For daytime exteriors use a Polarising filter to remove reflections. Polarising filters work best at 37¢ª angle to the glass. A warning here! Using a Polarising filter can reveal stress patterns in glass, not very attractive. Larger architectural pieces are also best recorded with light from behind the installation. Q5. How do you photograph/light delicately etched glass? A5. For smaller pieces, ideally shoot in a controlled dark environment, with minimal ambient light! Etched or cut glass is best lit by refraction. Use a decent size translucent 5x5ft Perspex sheet backlit by flash or tungsten. It is the black or dark around the glass not behind it that creates the effect. Once again use a tripod, frame shot tightly, and mask area outside of camera frame with black material. The black material and surrounding darkness is what the etching refracts-catches to reveal texture. This technique is called ¡®Light field illumination¡¯ (Think of a picture frame with dark wide frame and light picture/centre) This image can be inversed in Photoshop to produce a black background with white refraction! For non-coloured glass! If using supplementary lighting, place lights each side of the piece out of shot of course. If using natural ambient lighting, shoot late or early in day when the sun is low! Some excellent advice here about photographing a really difficult medium. Thank you to Bernard of Inside Out Photograph for sharing his skills and expertise with us. What a fantastic feature from Giles and Helen sharing their before and after pictures of their lovely kitchen. Giles quotes “After taking so much trouble to plan our wonderful new kitchen our designer came and put some rather dreary knobs on the doors and drawers, which looked so dull and cheapened the whole effect. Helen got on the web and found Merlin glass and Carol sent over a sample of one of Liam’s hand crafted glass knobs. The impact was amazing and we put in an order for another 47 for all the kitchen furniture as well as the scullery cupboards. We bought a few extra wondering how they would last, but 3 years on they are as solid as ever and they draw many comments from friends seeing the kitchen for the first time. Little things can make a huge difference and it is so lovely when they catch the morning light and cast a soft coloured shadow on the painted wood”. Kitchen door furniture is renowned for basic, low quality, mass produced fittings by replacing with our beautifully formed glass knobs they add value, quality and finesse. Glass knobs are like sparkling jewels catching the light and can really compliment the interior décor of a room. Customers often come to us to add those finishing touches or breathe new life into existing door furniture. Our glass knobs are made for customers wanting something very special, combining elegance with functionality, they provide that all important attention to detail and leave lasting impressions, essential for anyone wanting to improve their home. Thank you to Giles and Helen for sharing your lovely home with us. Interior design and new products have greatly influenced the metal work on door and cabinet hardware. Customers now want finishes which compliment their surrounds, polished chrome for bathrooms, satin nickel for kitchens, antique brass for vintage and old furniture and polished brass for Victorian and Georgian period homes. Traditional metal work has been dominated by 7 basic metals, of which we use 2, brass, yellow in colour and a recent contribution to our collection aluminium, white in colour. Brass is a metal alloy which consists of copper, lead and zinc, differences in colour result from the proportions of the various metals included. Aluminium is usually alloyed with around 4% of other elements and much lighter than brass. To accommodate all the finishes customers now want our door knobs and cupboard knobs undergo various processes. Some described as living finishes or natural where they take the colour of the base metal and can be either high or low luster, otherwise known as satin or dull for low luster and polished or shiny for high luster. By polishing, mopping, buffing, sandblasting, beadblasting and applying materials a variety of natural finishes can be obtained. Applied finishes is adding another metal by plating to the metal work, in our case brass. Nickel, Chrome and Silver are all plated finishes to change the appearance of the brass colour into one of these finishes. None of our metal work is lacquered, so they will naturally age or patina over time or they can be cleaned to obtain their initial appearance. Brass, satin brass, nickel, satin nickel, chrome, satin chrome, silver, satin silver, oil rubbed bronze, bronze, antique brass, blackened brass and aluminium. For some of these finishes the differences can be very subtle and we are regularly asked what they are. For the white metals; nickel has a yellow tinge, chrome has a blue tinge and silver is a bright white. For the yellow metals; bronze is a dark brown, antique is a yellow and black aged brass and blackened is a black brass. Recently a customer popped into our glass showroom to buy some more glass knobs. I was quite amazed when she said she had a rather long trip home to Scotland. Really enjoyed chatting to Lou, a fellow glass artist practising in stained glass. When Lou described her home, I new it would be a great blog feature, and what a delightful blog this is. Q1 What is your name and what region do you live in? A1 Lou, I live in Central Highlands of Scotland, overlooking Loch Tay, west of Aberfeldy. Q2 What kind of property do you live in? A1 It's a stone cottage on the side of a hill built in the 1840's originally as a farriers. Q3 What kind of style would you say best describes your interior? A3 It's a bit of a mixture! The weather is often gloomy, even in summer, so the light isn't always great and the bedrooms have small leadlight windows, so they're often dark, and the hallway is dark. Rather than paint everything in a pale colour, I've gone for dark and bold colours, and opted for good lighting. It's much cosier, cheerful and less shadowy from the eaves. The original kitchen was 9ft x 6ft really pokey. When we could afford it, we extended it to 33ft so it's now the heart of the home, with big energy friendly e-glass windows, and great views...it's very practical, cheery......the colour scheme was completely influenced by Merlin Glass door furniture! Q4 How did you come across Merlin Glass? A4 At least 12 years ago....I think it was an advertisement in Traditional Homes and Country Living. I love glass anyway and work in stained glass, but was absolutely smitten by the idea of handles and knobs in glass. So when I was on a trip down south, I went to Merlin Glass and picked out door handles for every room, and also a range of knobs for the kitchen, even though we hadn't got enough money for the extension at that time! I have just been down to Liskeard again and brought some more stuff - as fabulous as ever! Q5 What products did you choose and for what purpose? A5 Oval glass handles for the main room doors, the oval shape is very easy to grasp, and I think it was Liam who said that the shape was good for arthritic hands... so I was buying with a view to the future! Seriously though, quite a few older people have said how this shape is easy on the hands, which is a bonus. Front door has a pink and white swirl patterned knob which is nice to look at and quite funky! Then in the kitchen it's all cobalt blue knobs of various sizes. They lift the room and they lift my spirits every morning when it's wet and miserable outside! Q6 What advice would you give to others when embarking on a new interior project? A6 Gosh....well, don't rush it. Try and picture exactly what YOU want to live with and use magazines etc to get ideas. Don't follow current fashions if you don't like them. Get it right in your head before you even get started, down to the smallest detail, such as the door handles. And go for quality.....Liam's handles blend, they are 100% quality and sturdy, it's false economy to buy cheap stuff or poor quality, it can just spoil a room. Thanks Liam! Thank you Lou for sharing your lovely home with us and your ideas. I love your kitchen, it is so vibrant and from your description of your home, seems the perfect choice. Since featuring customer's homes we have seen some amazing uses of Liam's work. We both really enjoy seeing pictures of kitchens, doors and furniture with all their different uses and colour combinations. Powerful PR for Merlin Glass Over the years we have received some great press and editorials, however, this week our V&A success has seen some wonderful articles. I particularly like the double page feature in the Western Morning News by Simon Parker. Of course the lovely pictures capture ones interest but it is the true spirit and passion of the content which I am particularly drawn to and want to share with you on our blog. The opening paragraph is a powerful message "As the British Art Show, currently being staged at a range of venues, demonstrates, there's a big money and kudos attached to the fine arts. They are respected, valued and admired and publicly funded. The same cannot be said for the British crafts. Mention the word "craft" to most people and someone sticking shells on lampshades or painting pebbles might spring to mind. The reality, of course, is that the world of the master craftsman is far removed from both the conceptual artist and the amateur dabbler. Professional, highly skilled and often with years of experience under their belts, it was craftsmen who built this country's manufacturing industry, provided the expertise to drive the Industrial Revolution and, some might argue, put the "great" in Great Britain. Regarded by many these days as a slightly eccentric bunch, craftsmen are once again taking centre stage for a major exhibition at London's Victoria & Albert Museum called Power Of Making". The article goes onto describe Liam's work and his journey with Liskeard Glass and his own company Merlin Glass. There is quite an in depth interview with Liam, my favourite part is; "Liam's watch word is quality - and he abhors the current fashion for mass-producing shoddy goods. We import shiploads of badly made things from all over the world and what happens is they fall to bits and end up in our landfills. It's madness. I set out from the start to make things of the highest quality and I wouldn't be content if I made things of an inferior quality. There is a beauty and satisfaction to be found in things that are made well". Thank you Simon Parker for a reflective write up and capturing our true spirit. Making beautiful glass is one thing but just as important is the finish of the metal work. Our brass work is unique to us and our design. It is made by two companies both based in the UK, Cornwall and Birmingham. Liam use to make his own metal work but as he has become busier we now have this made for us. When all put together and polished our glass sits beautifully on a gleaming brass rose. However, over half of our work then needs to have additional work for additional finishes such as nickel, chrome, silver, satin. There are now many different finishes available, all have their specific look and requirements for our customers. Recently we have seen an increase in the demand for oil rubbed bronze particularly from our customers in America for kitchen, bathroom and cabinet hardware. The effect is dramatic and for furniture and doors on dark wood the finish is perfect. This is where the brass is considerably darkened, (we can match to specific finishes) and then buffed with beeswax to give it a rich, elegant yet rustic look. We love offering a variety of finishes, we want our products to look fabulous in your homes no matter what your look us. If it's interesting I will blog about it! We are delighted that our glassmaking film of Liam making a scent bottle has been selected to be shown at the V&A in conjunction with the Crafts Council, Power of Making exhibition 6th September 20011 to 2nd January 2012. The V&A is the world's greatest museum of art and design and this exhibition celebrates the role of making in our lives by presenting an eclectic selection of exquisitely crafted objects. The film was made last December by the very talented film maker Matthew Geraghty. It was a cold and snowy winter's day when Matt arrived to shoot. He soon warmed up with the heat of the furnace as Liam set about making scent bottles. This was such an enjoyable day and when we finally saw the edited version we were quite overwhelmed with the emotional connection the film made. We were delighted when a customer contacted us for some special door knobs for her home in France. The house is a traditional provencal house located on the St Tropez Peninsula with stunning views over the Mediterranean Sea. One of the requests was for the colours of the door knobs to compliment the surroundings, so a white washed villa over looking the Mediterranean Sea. Perfect for ambers, blues, aquas and peridots like jewels glistening in the sun. Sue had a selection of glass door and cupboard knobs in variou s colours in the smooth range all on brass to fit in with the traditional look and feel of the house. Thank you for sharing your beautiful home with us and providing the pictures. Gill in her own words has "liamised" her house and furniture with a variety of beautiful shapes and coloured glass knobs. Gill always sends me a picture of the project she is working on. I find this is very useful in helping to select options and colour schemes. Gill wanted the new handles to be bright, different colours and substantial but to fit in with the existing ones, which are flower like, but 4 of them have broken. As soon as I saw the handles I selected 4 daisy glass cupboard knobs. Gill was delighted with her new handles, they match well and said it's a real treat now opening and shutting the draws! It is a great idea to breathe some new life into old furniture, you don't have to replace everything just work the old with the new for a functional yet bespoke look. We work with all kinds of furniture makers as we share customers that really do appreciate quality and handmade goods. I asked Janice at Greenwich wood works a few questions for our growing in popularity blog feature. Q1 What is your company name, where are you and what do you do? A1 Greenwich Wood Works Ltd, established in 1981 in South East London. We are a leading design and manufacturing company specialising in bespoke furniture. Our team of 14 craftsmen and women and in house designer all work out of our restored old factory and warehouse. Q2 What do you specialize in? A2 Kitchens, Bedrooms, Studies, Larders and Dressers. Our service is bespoke, our designs are unique and exclusive to our customers. Q3 What style would you consider your work? A3 Flexible, traditional and contemporary, we are renowned for our Edwardian, Victorian and Georgian joinery. Equally our modern and contemporary designs provide originality and comfortable living. Q4 What is your relationship with Merlin Glass? A4 We have been working with Merlin Glass for over 15 years on various projects where customers require bespoke glass knobs. Our customers value the same old fashioned craftmanship and quality. You can visit Greenwich Wood Works website http://www.greenwichwoodworks.co.uk more information about their beautiful work. Thank you Janice for sharing your work with us, we always enjoy working with other makers sharing the same values of high quality, attention to detail, bespoke and unique and high levels of customer satisfaction. Before and After Sometimes customers come to us wanting to brighten up a piece of furniture which they have had for several years. This is what this feature is all about the before and after shots and story. Q1 What is your name and where are you from? A1 Gill from Scotland Q2 What products did you chose and why? A2 I asked Carol to choose me a random selection of shapes, sizes and colours for the project having sent a photo of the chest of drawers that I wanted to freshen up. Q3 Upcycling, refurbishing are all current buzzwords and trends why did you decide to make over your piece of furniture? A3 I've had the chest of drawers for many years. It is in my teenage daughter's bedroom and gradually over the years the pull part of several handles had come off and couldn't be reattached. I thought that Liam's cupboard knobs would look funky and update the whole appearance of the chest of drawers - and they did! On a practical basis the drawers can now be opened and closed easily again. Q4 What do you think of the finished piece? A4 Love it! Q5 What advice would you give to others considering a make over of their furniture? A5 A revamp can be a refresh! Create something a bit different from an item that has served you well instead of chucking it out and buying something brand new. Thank you Gill, I have really enjoyed this feature and when a customer asks me to use my artistic license, I love it and I was like a child in a sweetie shop, with so many to choose from. One of the glass cupboard knobs I selected is really unusual, it is an amethyst blown piece, it is very striking and I knew Gill would love it, and she said it is now her favourite one. Well Gill we certainly had fun dressing this piece of furniture and I too love the end result. More than often when customers are looking for glass door furniture we have quite a conversation about all the design options and finishes available (and yes there are lots) This blog feature is a classic example of a customer wanting an unusual finish, in this case satin brass which provides a smooth look to the metal work. We offer all our pieces in a number of finishes including polished and satin. Satin Nickel has been used by a number of interior designers and kitchen manufacturers looking for a specific finish. Q3 What kind of style would you say best describes your interior? A3 Traditional simple country with a modern twist. Q6 What advice would you give to others when embarking on a new interior project? A6 Save up and buy the best, rather than buy now and settle for a cheaper inferior product. Susannah went onto write "we are thrilled with our beautiful handmade glass door knobs, they are truly stunning pieces of door furniture which are such a joy on the eye as well as in your hand. And as the satin brass roses age, they will only get more gorgeous! Expensive yes, but nothing else we have seen comes close. They have transformed our doors and we absolutely love them, thank you". Thank you Susannah for sharing your home with us and such kind comments. Good advice there about buying the best, we know there is a great deal of glass out there, but to date we have not seen anything of comparable quality to ours. A great deal has been imported from overseas, our advice would be don't compromise on quality when it comes to glass. Today's customer blog feature comes all the way from Connecticut in America. When Josie contacted us for a special gift for her mother, we were delighted to make some glass fruit especially for her. Q1 What is your name and where in the world are you? A1 Josie an American living in County Durham. Q3 What products did you choose and why? A3 A glass apple and green pair. I brought them as a gift for my mother who loves ornamental glass. They were simple, elegant and beautiful. Q4 What do you look for in choosing a decorative piece? A4 It has to blend with the surrounding decor and connect to me emotionally. Q5 What other artists/pieces inspire you and why? A5 Both I and my mother also have pieces from Steuben and Murano because of their elegant simplicity and colour. Thank you Josie for sharing with us, we are delighted to hear your mother likes them. They look beautiful against the back drop of the stained glass. We decided to take our family to experience the world's oldest and largest music festival and what an experience is was to! It goes out without saying the mud was terrible but once the sun shined there was so much to see and do covering an area greater than 550 football fields! Travelling as a family meant a completely different kind of Glasto. Our previous visit was via bicycle and just Liam and I. This time we spent more time enjoying the performing arts and the amazing kidz field. Glastonbury has so much to offer an experience beyond many people's imaginations. The music is happening all around you with so much variety. Quite often the most enjoyable aspects are stumbling across a great sound and stopping for a dance. Visiting the unfair p layground, block 9, Shangri-La, Arcadia, the greenfields was pure amazement. One of the children's favourites was the wall of death watching motorbikes zoom around - it was scary! We stayed to watch the midnight spider perform in arcadia. This was quite something else watching something out of a mad max scene performing ballet accompanied by strings with fire all around. Visually stunning and dramatic. There is always great coverage of the headline bands which we very good, but the true glasto experience is seeing the weird and wonderful which the festival delivers on a spectacular scale. Block 9 has re-constructed tower block with a crashed train in it on one side of the field with a car suspended on top of a building the other side. The nightime ambience of this area was truly ecstatic. The world food, holistic therapies, crafts, performing arts, amazing vibes, people watchers paradise and general GLASTO bounce made it a memorable experience for us all. Q1 What is your name and where are you from? A1 Amy and I live in Dublin, Ireland. Q2 What kind of property do you live in? A2 It is a 3 bedroom 1950's semi-detached in a leafy suburb of Dublin that has a very modern open-plan extension on the ground floor. Perfect for an 18 month old to run around and burn off that energy! Q3 What kind of style would you say best describes your interior? A3 Eclectic! It is colourful and comfortable. I love to live in a space that feels "me" and not a magazine spread. Q4 How did you come across Merlin Glass? A4 From an article in LivingEtc magazine in 2010. Q5 What products did you choose and for what purpose? A5 We chose the clear frosted tripod handles for our built in wardrobes. They are painted a very muted duck egg colour and the rest of the room is dark purple and chartreuse green (it does work!) The handles are just beautifully neutral and give a bit of interest to an otherwise uninteresting, functional part of the room. Q6 What advice would you give to others when embarking on a new interior project? A6 Make sure to put what you like into the house and not what's "in" at the moment. You have to live with it long time. If you are starting a big renovation I would say never underestimate the contingency you need to have put aside to pay the bills. Thank you Amy for sharing your lovely home with us. Liam particularly likes Amy's images and their use on built in wardrobes. He said "oh wow and how beautiful they look". Liam particularly likes his tripod design inspired by nature they are so very unique. Today's customer blog spot focuses on our work with a long established furniture maker. Q1 What is your company name, what do you do and where are you located? A1 Daedalian, individually crafted furniture and we are based in Oxenhope, West Yorkshire. Q2 What do you specialise in? A2 Daedalian design, manufacture and install hand crafted, bespoke hardwood furniture including kitchens, bedrooms, studies, staircases and free standing furniture. Q3 What style would you consider your work? A3 Truly bespoke, we tailor every piece to fit with the clients requirements, classic period detailing with a modern design solution is our trademark. Q4 Can you give us an example of your work which has been really special (I know it all is!) A4 One of our recent projects is now in its 4th year as we are working through a full house room by room. My clients fell in love Merlin Glass knobs when they were proposed as an option. They now have 5 rooms fitted with solid oak cabinetry and a combination of clear, amber and peridot green glass knobs that finish the furniture beautifully. Q5 What is your relationship with Merlin Glass? A5 Liam's workmanship is second to none and Carol's enthusiasm for glass is contagious! We have worked with Merlin Glass on a number of projects where attention to details is paramount and the client is looking for something a bit different. Our customers love the glass cabinet knobs and often say they will have a piece of furniture designed to suit them! The images above have been provided by Daedalian and really do show how complimentary our work is, beautifully made furniture with beautifully made glass knobs. Thank you to Catherine and Jonas at Daedalian for providing such a great feature. My favourite has to be the free standing furniture piece, the composition works really well. If you are interested in Daedalian's work their website is www.daedalianfurniture.co.uk telephone number 01535 640860. Q2 What kind of property do you live in? A2 The house was built in 1855 and cost £432. It is a completely square "dolls" house. Q3 What kind of style would you say best describes your interior? A3 Traditional. Q4 How did you come across Merlin Glass? A4 Searching on line. Q5 What products did you choose and for what purpose? A5 We have replaced every door handle in the house with matching smooth clear glass door knobs. About 15 pairs in a mix of nickel and brass finish with half of them for rim lock fittings. We like the fact that they feel heavy and are fantastic quality. Our son regularly swings on one door and they do stand up to the test. We also have some clear cupboard knobs in the kitchen and bathroom and have some on a bespoke piece of furniture pictured above. Q6 What advice would you give to others when embarking on a new interior project? A6 Live in the house for a while before making large decisions. Thank you Tara and James for sharing your wonderful home with us, rich in history and character. Some great advice there about living in your home before making too many decisions, it's amazing how you grow towards certain features and ideas change over time. Today we feature - Jak and Liam's Artisan Collection. Jak wondered by the glassworks to purchase some door knobs. Looking at the displays Jak took a particular interest in all the unusual ones. Jak was able to handpick all of his door knobs, with the only prerequisite for none of them to match and all to be unique! Jak has had 2 visits now to our glassworks to choose his door knobs; his favourite is still the bright blue one, which is a very unusual one. The colours are amazing and the shape and texture work particularly well for a turning door knob. Absolutely delighted to see them all in situ. Q1 What is your name and where are you from? A1 My name is Jak and I live in South East Cornwall. Q2 What kind of a property do you live in? A2 A very drafty barn! Q3 What kind of style would you say best describes your interior? A3 Lived in! The majority of furnishings are solid, second hand items and then it's teamed up with some colourful textiles. Q4 How did you come across Merlin Glass? A4 I grew up in Liskeard and have walked past the shop countless times over the years. Q5 What products did you choose? A5 Since moving to our current property we have acquired eight door knobs and none of them match any of the rest. Q6 What advice would you give to others when embarking on a new interiors project? A6 At the end of the day it is your home and you have to live there. Throw in some colour for those rainy days indoors and spend time on the finishing touches. I really enjoy Jak's annual visit to our glassworks. I now know Jak's taste and his abstract yet resourceful vision is not too far off Liam's! Liam's concepts are very much around re-using, second hand and old furniture which is evident all around our glassworks! Thank you Jak for sharing your home and pictures with us. Q1 what is your name and where are you from? A1 Beverley and Alan and we live in South Lincolnshire, bordering Cambridgeshire and Norfolk. Q2 what kind of property do you live in? A2 Mid 1700 Georgian house, originally a farmhouse with Victorian additions. Q3 what kind of style describes your interior? A2 Typical country house style. Q4 how did you come across Merlin Glass? A4 I have known about Merlin Glass for several years, originally through an article in Country Living Magazine. Q5 what products did you choose? A5 I have replaced the door knobs on the ground floor with Liam's amber smooth door knobs with brass rose and escutcheons. I have recently redecorated and upgraded a guest bedroom and chose a cobalt blue flower shaped cupboard knobs for early fitted wardrobe doors and bespoke cupboards. Q6 what advice would you give to others embarking on a new interior project? A6 We consider ourselves lucky to live in a Georgian house. The only advice I would give based on our own experiences in an old house is to take your time and respect original features. Thank you Beverley for telling us about your beautiful home and some great advice about original features, couldn't agree more. These pictures are taken in Beverley's house, the amber is an early one of Liam's before he moved to the concealed rose. Welcome to our new feature. Our customer's are at the centre of what we do and we wanted to think about more imaginative ways to have greater customer interaction so have come up with the idea of having this customer blog spot. We asked some questions (to those willing) about their homes and interiors and are sharing their answers which we believe to be a great source of inspiration and ideas. Q5 - What products did you choose? A5 - Selection of large cupboard knobs all different styles and colours for wardrobe doors, press cupboard doors, small cupboard doors in the eaves, utility and bathroom cupboard doors and a wooden shutter which I have used to hang jewellery off! Q6 - What advice would you give to others embarking on a new interior project? A6 - Don't be too rigid, think freely about toning, matching, texture, natural light enhancement and artificial, eye catching possibilities and pretty things to look at and touch. Above all build a practical but comfortable environment to live and relax in. Thank you Gill for being our first customer blog spot, the pictures above are some of the items Gill ordered and photographed in her home. Last week saw the launch of our first international #glasschat on Twitter. It was such an exciting hour, which seemed to fly by, talking all things glass. I was very impressed with the diverse range of attendees with so many interests in glass including artists, glass blowers, decorative glass, bloggers, fabricators, interior designers, home and decor professionals, stained glass, various architectural enthusiasts, antique collectors and mirror and wall experts. Wow, so many interesting people out there and for the first time we now have the arena to come together across the world and share. The exciting thing is that this is open to everyone, anywhere, across the spectrum. Using some statistics, #glasschat reached 41,644 people via 344 tweets! That's pretty amazing. This week's #glasschat we are talking glass in the home which will appeal to just about everyone. We plan to cover an exciting topic each week over 5 questions which each have a 10 minute discussion. Ourselves and our twitter colleagues in America; Looking at Glass and Steuben are currently pioneering on this, but this is for everyone, so come along and join us on Thursday nights 9pm UK time following the # symbol #glasschat and see what all the excitement is about. For the past year we have been enjoying talking with all kinds of folk through various social media platforms. On Tuesday nights on Twitter we join professionals from across the globe to discuss interior design. Now some of us glass professionals want to start a weekly one hour discussion about glass. We are launching glasschat on Thursday 5th May at 9pm UK time, to account for all the global time zones, this will be a weekly event so please feel free to join us any Thursday. To join the conversation we will be using the hash tag #glasschat so that everybody can follow. The aim of the sessions is to share, learn, collaborate, meet new people, have fun and talk about what we all love GLASS! Glasschat is being hosted by us @merlinglass and other like minded tweeters in America, @lookingatglass and @steuben. Please feel free to join us and let the creativity begin! Since we have embraced the World Wide Web we are now onto website number 3 and hasn't the web grown up since our first website back in 2001. We are very excited about the launch of our new e-commerce website this week. It has taken over 6 months to have a specially custom built site. For us an off the peg design package did not fit neither Liam's work nor our ethos so we teamed up with Richard at d8com to design and build a new site. I never imagined how much time and effort was needed into putting all Liam's work into an e-commerce format. It was also essential the website reflected Liam as an artisan and designer maker, illustrating his creativity and of course having a functional site which not only looks great but is a pleasant visiting and shopping experience. We love our new site and hope all our visitors do. Some more features will be added over time but we believe we now have a website which is as first class as Liam's work. Over the years Liam has made many beautiful pieces but I particularly like his solid glass pears and apples. These are lovely art forms and capture ones need to look and touch. It is quite a pleasure to feel the weight as they are solid glass pieces with a soft velvet exterior. I asked him why he decided to make them. I have found the answer is always the same as he says "I really like the shape of them, so I give it a go and liked how they turned out, it was a bit of fun" He particularly likes the pears, almost a bit cheeky in their appearance yet beautifully elegant. What works so well is the crispness of the stalk. Liam wants to make more fruit and experiment with colour, shape and form. Taking the apple and seeing how far he can change it but still reflecting an apple. Deep purple is also another sensual colour to integrate into these pieces. When I talk to Liam about his work, his ideas and creativity its fascinating to listen to. Often abstract, unthinkable because Liam is a pioneer, having the ability to imagine and make what is not already there. Quite often I wonder what it will look like and then when he makes I watch with amazement. This is what being a true artisan is all about, designing and making beautiful original pieces, inspired by ones imagination. Glass studios as they become known where introduced into the UK by Sam Herman, from Mexico. In 1969 he set up the glasshouse in London. Liskeard soon followed with its glassworks established by John Randle in 1970. Jim Dyer, Bill Robson (ex whitefriars workers) and Duncan Randle ran the successful glass studio. Liam joined Liskeard glass in 1977 at the age of 16 as an apprentice. He finally took the place over in 1983 and renamed it Merlin Glass. Liskeard Glass at the time was most notable for its fine wine glasses and tankards. The wine glasses were not the usual crystal they were soda glass influenced by Swedish glassmaking. They had 2 ranges of wine glasses Tamar and Lynher named after local rivers. 2 teams of glassmakers used to make 400 tankards a week, along with wine glasses and candlestick holders. However, it is best known today for the knobbly vases which have survived over the years due to their chunkiness. These glass vases were actually made to empty the furnace after making the glasses. 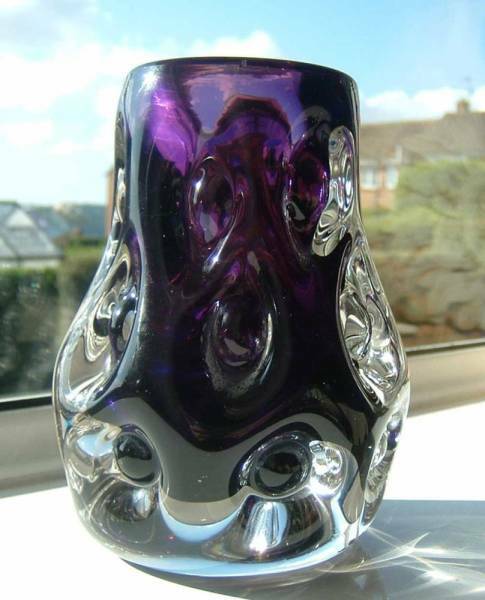 LG was embossed on the bottom of the knobbly vases which were made in purple, green and clear. Today Liam uses many tools which originated from these early years. He has an interesting collection of glass from masterpieces through to works which didn't quite make it! The whole place is rich in history, glassmaker's stories, various glass pieces and years of experience and raw talent.......and long may it continue. Liam makes solid glass love hearts for both door and cupboard knobs in amethyst purple and clear glass which can be frosted. These are really very beautiful works of art and not only look stunning, they work very well as a functional glass turning knobs. Each individually handmade and no two the same, these are difficult pieces to make. As a designer glassmaker Liam has designed and made a huge number of glass knobs and the love hearts are one of his favourite. We have a love heart on the outside of our front door and the millefiori on the otherside. I feel it adds a sense of warmth and "love" when entering our home. The cupboard knobs are particularly popular for children's rooms and the heart door knobs themselves find there way into all kinds of homes. We have seen many trends come and go at Merlin Glass. Liam is responsible for the resurgence of colour glass knobs here in the UK. One which we particularly like is BLUE glass, or as its known royal blue or Bristol blue and it's back. I adore these glass knobs and just recently we have taken so many enquiries and orders for blue glass! These are off to County Durham to a new home. Not only do they look amazing the shape works particularly well as a turning door knob. These are from Liam's balloon collection, in Liam's unique way fully swaged onto their fittings, the weight and quality of these solid genuine handmade glass handles is very impressive. These are on a polished brass rose; they also look beautiful on silver, as the whiteness adds pure luxury. Our satin brass is also a really nice effect, adding a softening almost gold like look. It's so nice to see some colour back into our homes enriching beauty, form and function. Merlin Glass - exhibitions and events. Liam is a quiet, shy artisan and over the years has attended a few events. I on the other hand adore what Liam makes and wants to shout about it at every opportunity! Having a young family does not allow us to attend many of these wonderful shows, but from time to time we do escape. In 2007 I exhibited in Dubai as part of the Exclusive British Showcase event, highlighting Britain's best manufacturers. This was very exciting, zooming off to Dubai to meet interior designers and architects. Last week we went to the Birmingham NEC Interiors show, not to exhibit but to meet buyers. This was a fascinating day sharing our work with interior designers and architects from overseas including Russia and Denmark. Liam's work is always a joy to share with others, the colours, the quality and the huge choice makes our work stand out from anything else. It is exciting times for us at Merlin Glass as global interest in Liam's work continues to grow and our wonderful glass finds its way to new homes and lifestyles. Packaging - sending out glass requires a good packaging system. We make beautiful products and we have made a conscious effort not to produce fancy boxes but to have packaging that actually works and is also environmentally friendly. I have recently been looking into this and was delighted to find Paperpack a Cornish based recycling company. We really like to support Cornwall so was pleased to find a local supplier. Visiting their premises located in Redruth, it is located at a disused mine, so was pretty impressive to see the old engine house and stack. What was also interesting was seeing all the recycling in action, boxes, cans, milk cartons, paper and cardboard. It was so nice to have a choice to be able to choose Corn starch instead of polystyrene chips, bio degradable bubble wrap, paper shred and card board box over runs. I was able to source our packaging requirements locally, from a recycling source and knowing that it can be either reused or recycled. Our ethos at Merlin Glass is very much about sustainability, making a quality product, within the UK, which will last a lifetime. When you receive our goods, it is not about a decorative box, it is what is inside that counts, knowing that the packaging has kept it safe, has done its job and can be reused or recycled again. Following on from our glass works story at Pavlova Mill we are also fortunate to own a shop / showroom for our glass which is situated in a beautiful Victorian property built by the Victorian architect Henry Rice. Liskeard believed to have come from the words Lys Kerwyd, meaning Kerwyd's court or palace become a thriving market town from the 13th century onwards. In the 18th century Henry Rice 1808 - 1876 who was a gifted and sensitive architect was responsible for a very substantial part of the older parts of Liskeard which we see today. There are over 100 Henry Rice buildings in and around Liskeard. Our building Denmore House, grade II listed has had many uses over the years including council offices and WRVS. The ground floor is divided into our shop/showroom and office, with living accommodation above. We are so fortunate to be located in such rich history. Many of our glass door knobs also find their way to period properties supplying Georgian, Victorian, Edwardian and listed properties throughout England. Grade II listed..... December was a very busy month for us here at Merlin Glass, with one of our largest orders. Liam made 48 pairs of clear and amber balloons on a mixture of silver and nickel roses and a number of matching cupboard knobs for a very special grade II listed property. Silver has not been as much of a popular finish as more recent trends of nickel and chrome have dominated door furniture due to a flux of imported inferior products. Silver also tarnishes, which ages door furniture nicely, alternatively silver cleaner sees them shine again. Silver is a lovely finish, a brighter eye catching colour which really does make these glass knobs shine and in a class of their own. This was a beautiful order for a home which has been lovingly restored over a number of years. For those finishing touches our hand made glass door knobs really do add that piece de resistance! Our Glassworks address is actually Pavlova Mill. The mill dates back to the 19th century where it was used as a tannery making gloves. There is very little history on Pavlova Mill but it is said to have been named after the Russian Ballerina, Anna Pavlova, one of the finest classical ballet dancers in history! The tannery is said to have made gloves exclusively for the dancer, whether or not this is true, the mill has taken her name. I knew very little about this amazing woman but since researching this blog have found out a great deal including some beautiful short footage on you tube. She was the first ballerina to tour ballet around the world. I am not sure whether there is a link to our glassworks but it's an amazing story rich in history, beauty and admiration. Maybe some of that sparkle shines over us today as Liam continues to hand make beautiful works of art. Something a bit different..... December was a very busy month for us at Merlin Glass and it seems that customers are experimenting again with glass and coming to us for more bespoke designs. We have seen a big increase in all kinds of customers wanting glass knobs that fits their designs, not just off the peg sizes. Architects, furniture makers, kitchen makers and interior designers are sourcing specific sizes and finishes. We have seen everything from small 50mm clear glass mortice knobs on polished chrome, to big 70mm flat discs, to bright blue flowers made especially for a shower. Customers are actually bringing in a piece of their furniture to our showroom to try out different options. Our glass knobs are being used in conjunction with some beautiful furniture both old and new. The colours are proving popular too, purple and amber for kitchens mixing the sizes for bigger doors, frosted chequerboard for an unusual alternative and one of my favourites amethyst on nickel a really stunning combination. Knob of the day - I have been running a feature on our twitter page (@merlinglass) which has become very popular. Each day I post a picture of one of our lovely knobs whether it is for doors, furniture, kitchens or cupboards. Today we feature the frosted glass whirl cupboard knob. A customer ordered 20 x 42mm frosted whirl cupboard knobs for her custom built wardrobes. These beautiful knobs really do add the finishing touches to this customers wardrobe. Really pleased to have the very talented Matthew Geraghty with us today making a film about Liam and his glassmaking. We teamed up with Matt who has a depth of both BBC and ITV broadcasting to really bring what Liam does to life. At the heart of what we do here at Merlin Glass is that everything we do has been handmade by Liam. His talents as a glassmaker are second to none. We believe this film will really give an understanding to our customers about who we are and why our work is so special. With the help of Matt's fantastic camera shots we can bring our glassworks to our customers. Showing customers what goes on behind the scenes and how these beautiful pieces are made. Can't wait now to be able to share this film with you. Bespoke design - when customers find us they have ideas about their door furniture but these ideas need to be brought to life. This is what offering a bespoke service is all about. After finding out about their home and interiors I am able to send a selection of samples to help choose. Upon this we are then able to make precise glass door furniture. This customer wanted something very specific, and completely handmade for her. Liam made 15 pairs of large glass balloon door knobs on a polished chrome rose. They look absolutely stunning and completely match the customers specification. This customer had both custom made doors and glass knobs as part of their home refurbishments. Millefiori Glass Knobs - this weekend Liam has been making millefiori knobs for a customer's order who wanted specifics sizes for her daughters wardrobes. She wanted 35mm and 50mm which Liam was able to make. Liam gathers a small amount of glass to make 35mm knob and then rolls it to shap e. He then selects a number of glass beads and places them into the glass. The beads are from Murano, Italy and come in many beautiful colours. Millefiori means a thousand flowers and really are very pretty. Millefiori have always been a big favourite of mine, they really do add excitement, colour and personality into door furniture. Liam makes both clear and blue millefiori glass knobs for doors and cupboards. Liam can make glass door knobs for doors which have either mortice or rim lock fittings. Mortice means a mortice slot is cut into the side of the door which the lock is inserted into. A spindle then goes through the lock and a glass knob slides onto the spindle and then attached to the surface of the door. A rim lock is visible by a box which is mounted onto the door and there is a key. Many properties of the Georgian, Victorian and Edwardian eras have rim lock doors. Doors were much thinner then with no regulations for fire or security. Rim locks come in the form of two knobs, one will have a backing rose for the non lock side of the door and one will have no rose as it is fitted into the lockside. Therefore when Liam is making glass knobs for rim lock fittings, he mounts the glass knob and ferrel directly on a bar. Sometimes he has to make very special door fittings to fit a whole number of bespoke designs. This has included fitting glass knobs to antique mirrors, showers, traditional old style European doors etc. Liam will work off the existing door / locking mechanism to make the new fittings. This is when being a craftsman really does shine as Liam's skills and experience can make truly unique fittings. When making the knobs Liam makes the base .25mm larger than required. He then uses diamond grinding wheels to grind the glass to fit the brass ferrel. There are various sizes according to the size of the glass knob which are specially made. An epoxy resin is used to form a layer to sandwich between the glass and metal work and then each piece is swaged into position where the brass work is rolled over the glass. This makes Liam's work particularly special as once the metal work encloses the glass they are completely glasped on. It is left to set for 24 hours and then ready for polishing, which is a 3 stage process. First the sizel mop for course polishing, then a soft cotton mop and a medium paste and finally an unstitched fine mop for fine polishing, resulting in highly polished brass, not lacquered. At this point the knobs are ready for assembly but many go onto the platers for additional finishes such as nickel and chrome. To assemble them Liam uses a step washer, flat washer and circlip which enables them to turn freely. The backing plate or rose as it is called is fitted with the washers and circlips, ready for the finished product. As a maker Liam often gets asked for variants, fixed components etc which of course he is able to do as a maker! The tip of the iron is gently placed onto the surface of the glass inside the furnace and rotated one and half turns to create an even gather. Slightly moving forward the iron is then rotated for a further 6 times in approx 3 seconds! Carefully removing the iron it is continually turned whilst walking to the bench. Turning the iron with Liam's left hand he then takes a soaked folded pad of newspaper and strokes the glass from the top back towards the iron, cooling and centring. Stroking the glass removes the wrinkles. The piece is then placed into the glory hole, flashing the outer skin. Back at the bench, Liam uses the priscillas to form the foot of the knob, hanging forward to elongate and using wax to lubricate the tools so that it does not catch and reduce friction. The piece is worked several times using the glory hole to heat and create the right size and shape which can take around 5 minutes. Different patterns and shapes require different techniques but follow variations of this process. Liam enjoys making his love hearts, he considers they are a bit of fun and make him smile! Glassmaking tools.....Liam uses a range of tools to work the glass, some have been passed on from previous glassmakers, some brought and others made. A favourite is a pair of very old jacks from Whitefriars of London. Jacks come in a range of sizes and are used for reducing the size of the glass, held vertically in one hand and lubricated with beeswax. Priscilla's have wood on them and are used to open up vessels. Liam has an impressive collection of these in varying sizes each for very specific jobs. Wet newspaper is used to shape the glass along with wooden cup blocks made out of soft fruit wood. Shears and scissors are used to the cut the glass and tongs for pinching and teasing. A number of measuring tools are used including a vernier which measures down to a tenth of a mm. Marva is a table used for rolling the glass to shape it and applying colour. The irons are made out of steel with a high carbon steel end for the hot end. Liam uses different sizes for different pieces of work from 12mm through to 50mm. Next blog..... making a glass knob! Making a moorland vase - Liam makes so many different vases which are all made differently depending on the creation. To make a moorland vase, enamel is placed onto a tray and then a piece of glass using a blowing iron is gathered from the furnace, which is about the size of a large apple. A wooden cup block is then used which is a soft fruit wood (pear, apple or cherry) which gives the glassworks a distinct aroma. It is then rolled down the bench and shaped with the cup block giving it an even round shape to provide uniformity with the iron. The piece is then turned into the enamel so that it sticks to the surface. It is then flashed into the glory hole and repeated to build up layers, thus giving the pattern and differential between the glass and colour. Liam then blows down the iron, to create a tiny bubble which makes the piece bigger; it is then allowed to cool so that when the next layer is gathered the inner layer will be able to support it. Approx 2/3 of the piece is gathered again in glass, it is blocked, cooled and warmed up to balance temperatures and shaped using wet newspaper, the block and blowing to increase size. Different techniques are applied such as hanging it from the iron to elongate it. The whole process can take around 10 minutes, it is then puntied and the front piece is then worked taking another 5 minutes. It is then stood on its end, the punty knocked off and then the heated tongs are used to place it in the kiln for annealing. A great deal of focused concentration is required alongside the ability to be calm and relaxed to create and work the piece. Most glassmakers work with an assistant but Liam has refined his processes so that he can work on his own. He will make between 10 - 20 vases in one session. Glassmaking, Liam makes a selection of pieces which all require a range of techniques and skills. These have been refined over the years as his experience and indeed tools have evolved. Over the next few blogs I will guide you through the making of various pieces. Common to all pieces is the set up of the glassmaking area. This is relatively a small area positioned around the bench and furnace. Next to the furnace is the iron warmer, where the irons sit warming ready to be used. Liam gathers the glass onto the iron and takes it to the bench, slowly turning it to keep the glass moving. He then uses various tools to shape and work the glass. As the glass cools, he moves to the glory hole to flash it and heat it so he can continue to work it. This is carried out as many times as required to work the piece applying various techniques. Sometimes a punty is made where another piece of glass is gathered on an iron and then used to attach to one end of the piece, so that the other end can be worked. Once the piece is finished it is then gently knocked off and placed into the kiln overnight for annealing. This is to enable and even cooling process to balance the temperatures of the glass as it cools. Observing Liam making is rather exhilarating with all the noise, heat, glowing light and high energy. It is somewhat rhythmic as it flows from one process to another. It is mesmerizing and he makes it look so easy. I have tried it, believe me it is not! Spending hours watching him I feel I can just create something marvelous. Atlas, the glass is hot, the irons are hot and heavy and you have to try and turn it and work it all at the same time, remembering not to touch it as it droops into a blackened red gloop! Needless to say I haven't created anything amazing yet! Next blog, vase making. Glassmaking ingredients.... Liam uses soda lime glass, this consists of course silicate sand which comes from the West coast of Scotland, soda, lime, potassium, nitrate, borax, lead and antimony which makes clear glass. Colours are made from trace elements and rare earth elements. Liam makes clear, amber, purple, peridot green and various blues. When making colours each one has a different effect and therefore quite a bit of testing and alterations to the temperature is carried out to ensure the desired colour. The consistency is known as batch which is sieved and mixed to form a fine grey powder. Adding the raw material to the furnace is called charging. Temperatures are increased by 100 degrees at a time taking it from 1000 to 1200 degrees. Liam undertakes 2 charges, adding layers of batch. This is then added to the pot furnace via a large spoon. It then melts into a blamonge like substance and joins together via tiny bubbles, which form into larger bubbles. It takes around 8 hours to refine this process to make glass, then another layer is added and repeated. Liam checks this process by placing an iron into the furnace and gathering a small amount to see its clarity and colour. The furnace.... when Liam started at the glassworks he used a large slab furnace designed for its reliability and robustness. Liam then went onto design and build an additional 3 furnaces, including his current model a recuperating furnace which runs on gas. It re-uses the waste heat by warming the combusted air. The furnace is not on all the time it is only turned onto make, but it does take nearly a week to get it up to the high temperatures needed to make glass. The furnace is quite small approx 16ft square and made out of fire bricks and insulation bricks. It has a closely fitting door to keep the heat in. Inside the furnace there is a 17 x 10 pot or crucible as it is known where the batch is placed to melt. Melting takes place at temperatures between 1000 and 1200 degrees. Inspiration..... as a designer Liam is influenced by beauty, form and function. Living in Cornwall it is surrounded by stunning coastline and rugged moorland. It is these forms that have stimulated Liam's ideas and feelings. Many of his pieces reflect nature, flowers, seeds, pebbles and sky patterns. Each piece is very personal, encapsulated with Liam's creativity. Liam has observed the colours in nature and the space between them, he likes making small, free formed pieces with subtle colours and simple patterns. His other passion is in architecture and observing design, structure, materials and art. He is particularly interested in doors and locks which has influenced his designs for glass knobs. Making handles which are used and admired by everyday people, bringing light and beauty to the world of interiors. The diary of a glassmaker, the story so far..........At the age of 16 Liam went to work at Liskeard Glass, in Cornwall, England where he soon fell in love with the craft and art of glassmaking. At 21 he took the opportunity to buy the glassworks and renamed it Merlin Glass. Liam made vases, bowls, scent bottles, vessels, flowers and was watched by 1000's of visitors from near and far.